A lot goes into creating the perfect show. 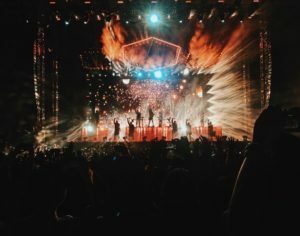 You have to get the performances just right, the lighting and design of the stage must look perfect, and you have to keep your performers and crew safe. If the set up of your show isn’t of the highest safety standards, however, then the rest of the show cannot go on. Silver State Wire Rope and Rigging is a trusted wire rope and rigging supplies company for everyone in the Nevada entertainment industry. Certified in Nevada and California, we follow all of the necessary safety standards and regulations needed to keep your show staff protected. Our entertainment rigging supplies at Silver State Wire Rope and Rigging keep these stage elements in place or on the move when necessary so that nothing dangerous happens before or during the performance. The flashier and more intricate a show is, the more vital it is to have a certified and accredited entertainment rigging supplier on at your service. Silver State Wire Rope and Rigging offers many supplies and services for those in the entertainment industry. We can lead you in the right direction of what your stage needs so that your event runs smoothly and safely. At Silver State Wire Rope and Rigging, this is our specialty. We can fulfill any and all rigging needs, from wire rope, trolleys, shackles, and more, depending on what your show requires to be safe. Most stage productions have a truss on set to support various structures. When you choose Silver State Wire Rope and Rigging, we can supply you with any type or size of a truss—we can even customize one specifically for your show. We have a wide array of hoists offering safety and precision to any part of your stage. From electric to manual hoists, Silver State Wire Rope and Rigging promises to keep your show to the highest standard with our products. There are good shows all over Las Vegas. To put on a great show, though, safety must be of the utmost concern. At Silver State Wire Rope and Rigging, security is our No. 1 priority, and we can help you with any needs and special requirements you have to get your show up in action. To start doing business with us, give us a call at (702) 597-2010. Visit our contact page for our hours and address information.